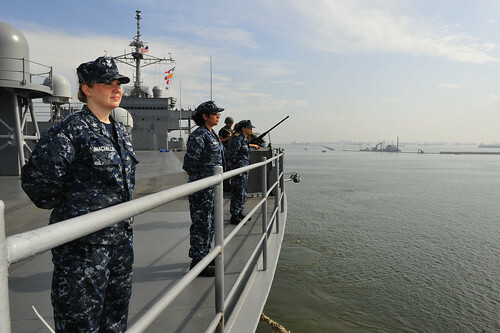 JAKARTA, Indonesia – U.S. 7th Fleet flagship USS Blue Ridge (LCC 19) along with embarked 7th Fleet staff, Helicopter Sea Combat Squadron 12 and Marines from Fleet Anti-Terrorism Security Team Pacific (FASTPAC) arrived in Jakarta for a port visit May 25. While in Jakarta, Sailors and Marines will host guided ship tours and participate in tri-lateral soccer and volleyball games with members of the Indonesian military and visiting Republic of Korea Navy sailors. "Pulling into a port like Jakarta gives the command an opportunity to project a positive perspective to local nationals," said Lt. Keith Leung, the Blue Ridge boiler repair officer. "It gives us a great opportunity to engage with the people of Indonesia and learn who they are, and what their lives are like in a place many of us wouldn't typically have the opportunity to visit." Some crew members are looking forward to the opportunity to engage with the people of Indonesia to learn more about their cultural background. "It leaves a lasting impression when we arrive in a new country and make a concerted effort to participate and interact with the local community," said Information Technician 1st Class Nhiel Amposta. "I always look forward to meeting the people of another country and to learn about their customs. It's a way to learn new things about the country you're visiting and maybe some things about yourself, too." Blue Ridge port visits represent an opportunity to promote peace and stability in the Indo-Asia-Pacific, demonstrate commitment to regional partners and foster growing relationships.